Find out what you DON’T know about how and why the herb you choose works. If you’ve been asking similar questions, this program is for you! Single Herb Courses, One Herb At-A-Time. Take full advantage of the healing power of the herb you choose. You’ll be able to walk into most grocery stores and choose the right herb, or order the right herb online. You’ll be able to select from a wide range of herbs including Lavender, Peppermint, Cannabis, Echinacea, Ashwagandha, Myrtle, and so many more. You’ll be able to walk into your kitchen, turn the stove on and get started right away making teas, blends, or tasty dishes you and your family can enjoy, all while getting crazy healthy! You can begin to better manage your particular health concerns. You’ll be able to visit your doctor or healthcare provider with better questions about what herb you think might be good for you. And finally, you will begin to notice you have graduated to another level of enjoying the power of integrating your body, mind, and spirit connection. This is a gift herbs give. I love this question… How do I choose the right herb? It covers everything I care about… connecting the body, mind, and spirit, herbs, cooking, essential oils, western and eastern healing perspectives, and a consideration of what is cutting edge, ancient, and traditional. I’ve been teaching, speaking at public health seminars, and working with private clients for over 30 years. I want you to be able to enjoy and have access to the same time-tested, effective, and truly life-changing simple solutions that I have. I’m Ann Christensen, founder of White Rabbit Institute of Healing (WRI Healing), and to help answer these and other questions I’ve created a series of courses to help you meet YOUR health goals and take full advantage of the healing power of herbs. As a former professor at Bastyr University, one of the world’s most renowned schools dedicated to a wide range of medicinal healing modalities, and as a practitioner with 30+ years of experience, I am committed to providing you with a wide range of perspectives and approaches including science, energetic healing, Oriental Medicine, herbs, essential oils, and the wisdom found in Ancient, Shamanic, and Traditional healing practices. WRI Healing is where East meets West and ancient meets cutting-edge. 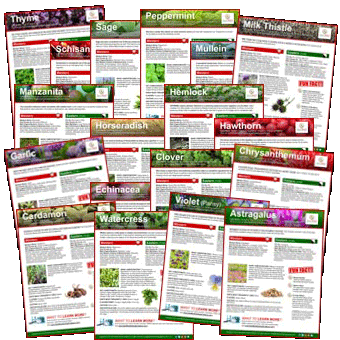 These courses and their bonuses are a final key to bringing what you may already know about herbs to life so you can begin to get herbs off the page and into your daily life. SPECIAL BONUS! I’m offering an special bonus with my FOREVER PLUS+ package. 8 Training sessions on how to use Key Herbs instead of pharmaceuticals for each of the following topics… Inflammation, Anti-viral, Detoxing, Anti-bacterial, Immunity / Adaptogen, Analgesic, Digestion / Tonic, Antioxidant. This special program has a $297 value.